Thinner, lighter, more powerful than ever before. And incredibly, excitingly new in so many ways. It deserves a new name. 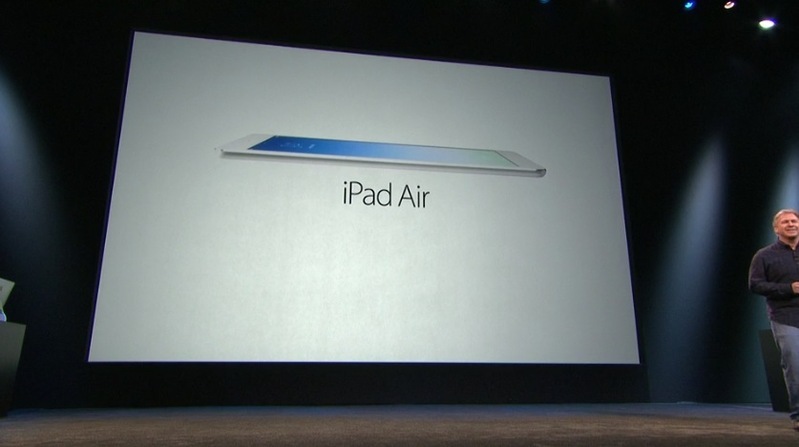 The new iPad is named: iPad Air. It still has a 9.7″ Retina display. The bezel around it is dramatically smaller. It’s 43% thinner than the previous version. And 7.5mm thin versus 9.4mm for previous version. The iPad Air is not only thinner, but lighter too. New iPad Air is 1.0 lbs versus 1.4 lbs. for the old device. It’s the lightest full-size tablet in the world. The iPad Air contains the A7 chip from the iPhone 5s. The M7 motion coprocessor is included as well. It’s also the first iOS device with MIMO for faster 802.11n performance and has expanded LTE support. Further details: 5MP iSight camera, 1080p HD video, a new FaceTime HD camera with larger pixels, improved backside illumination, dual microphones and 10-hour battery life. The new iPad air comes in silver/white and space gray/black and it will replace top-of-the-line full-size iPad. Pricing starts at $499, $629 for cellular. iPad Air shipping on November 1 in many, many countries, including China. iPad 2 will remain $399 for 16GB Wi-Fi. There’s a new polyurethane iPad cover for iPad mini and iPad Air for $39. The leather iPad case costs $79 for iPad Air, $69 for iPad mini and comes in Product (RED) version as well.